I was browsing Reddit when I came across this stunning piece of art work by ImaDreamwalker (Leonardo) over at Deviant Art. 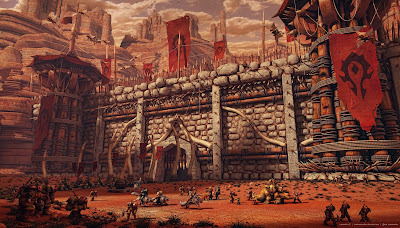 It also inspired me to start a new section here on WoWScapes for fan art. I am more than happy to kick this section off with this wonderful piece. It was also featured on the original World of Warcraft website in the Community Spotlight. Be sure to head on over to his Deviant Art page and comment on how amazing this masterpiece is. Leonardo spent over 20 days working on this using 3D Studio Max 2011, Vray 1.5 sp5 and Photoshop CS4. He also said he has many more ideas for future World of Warcraft pieces he wants to create. I noticed he had another piece in his gallery for Trisfal Glades. Another awesome piece! I am going to bookmark his Deviant Art page for sure and I am looking very forward to his future pieces. Thanks so much WoWMarketeer for sharing this! Looking forward to it thanks! Wow, 20 days spent on this? That's awesome! Very nice. Yes, make sure you view the full resolution version at the bottom of the post. It's quite large and the detail is spot on.